Cartier, acknowledged as the very epitome of French refinement, brings to its collection of master timepieces the Cartier Ballon Bleu 28mm—a watch with lofty ambitions and rarified airs. 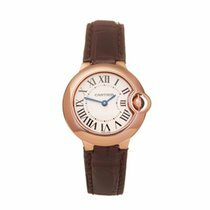 Staying true to Cartier’s tradition of crafting exquisite timepieces that hang delicately from the wrist, the diminutive 28mm model exhibits a slender elegance all of its own. Meticulously constructed from only the finest materials, the Ballon Bleu 28mm displays all the characteristic Cartier splendor that has made the brand a longstanding favorite among the very highest echelons of society. Featuring a quartz movement of unparalleled precision and wound by a fluted crown set with the Ballon Bleu’s iconic synthetic spinel cabochon, each of these magnificent timepieces boasts a thickness of just 9.35 mm. The Ballon Bleu de Cartier watch 28mm showcases a sensual composition found within all of the Ballon Bleu models—a casing of convex curves forming a smooth, tactile pebble around the wrist. This balance born of symmetry and style gives the Cartier Ballon Bleu 28mm its distinctive appeal and enduring place within the horological world. This is no mean feat considering the Ballon Bleu is the most recent introduction to the Cartier catalogue. 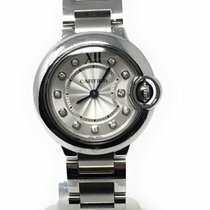 Released in 2007, a combination of technical craft and a background in fine jewelry quickly pushed the Ballon Bleu to the very forefront of the consumer watch market. As the smallest and most elegant model within the collection, the Cartier Ballon Bleu 28mm lends itself to any wrist looking for the most delicate of touches and is a favorite among the most sophisticated and stately men and women around the world. 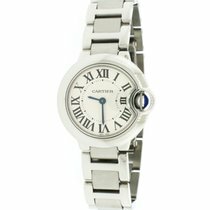 The Ballon Bleu de Cartier watch 28mm presents itself in many guises, each with its own distinct appeal and allure. Studded with precious stones or pared-down and practical; whether extravagant or restrained, the guilloche dial and sword-shaped hands reveal this watch’s unmistakable identity. Each Ballon Bleu 28mm movement sits securely within expertly machined cases fabricated from a variety of materials, including stainless steel, 18k pink gold, and rhodium finished white gold. Finally, a choice of leather strap or matching metal bracelet finishes the Cartier Ballon Bleu 28mm, ensuring both security and sophistication in equal measure. By combining a longstanding legacy of incomparable jewelry design with a dedication to crafting the most desirable watches in the world, Cartier has created a timepiece that transcends the banal restraints of form and function. 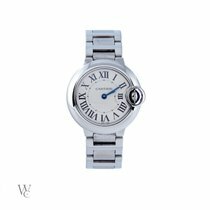 Adored by royals and nobility, celebrities and superstars, the Ballon Bleu de Cartier watch 28mm is the contemporary choice that will always draw the right kind of attention. Float away with the Ballon Bleu 28mm.